Easton, PA ServSafe® One to One Certification Exam sessions are designed for the busy industry professional that wants to complete an online course the complete the certification exam when finished or just take a certification exam. The sessions are scheduled on-site at Your Business (Must be during operation hours.) or at a Local Public Library. You make the choice of location when registration is made and the address will be sent to you in the reminder email of the scheduled session details. Princeville, OR ServSafe® One to One Certification Exam sessions are designed for the busy industry professional that wants to complete an online course the complete the certification exam when finished or just take a certification exam. The sessions are scheduled on-site at Your Business (Must be during operation hours.) or at a Local Public Library. You make the choice of location when registration is made and the address will be sent to you in the reminder email of the scheduled session details. 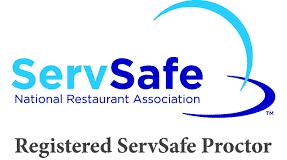 Charleston, SC ServSafe® One to One Certification Exam sessions are designed for the busy industry professional that wants to complete an online course the complete the certification exam when finished or just take a certification exam. The sessions are scheduled on-site at Your Business (Must be during operation hours.) or at a Local Public Library. You make the choice of location when registration is made and the address will be sent to you in the reminder email of the scheduled session details. Beaufort, SC ServSafe® One to One Certification Exam sessions are designed for the busy industry professional that wants to complete an online course the complete the certification exam when finished or just take a certification exam. The sessions are scheduled on-site at Your Business (Must be during operation hours.) or at a Local Public Library. You make the choice of location when registration is made and the address will be sent to you in the reminder email of the scheduled session details. Erie, PA ServSafe® One to One Certification Exam sessions are designed for the busy industry professional that wants to complete an online course the complete the certification exam when finished or just take a certification exam. The sessions are scheduled on-site at Your Business (Must be during operation hours.) or at a Local Public Library. You make the choice of location when registration is made and the address will be sent to you in the reminder email of the scheduled session details.